Speaking during a high-dollar fundraiser at the home of the show's creator, Shonda Rhimes, Obama used a now-familiar phrase - "phony scandals" - to describe what he sees as a petty obsession among the political class. "No offense, 'Scandal's' a great show," he said told Rhimes and the drama's star, Kerry Washington. "But we don't want to be living it out." And while Americans are watching warily as crises unfold overseas, Obama said "the conflict that probably makes people most discouraged is the conflict they see in Washington." It's a midterm election message Obama has been peddling more frequently as this year's contests approach. During remarks around the country and at Democratic fundraisers, Obama has taken to lambasting Republicans and the media for fueling an endless cycle of made-for-TV controversy, citing dust-ups at the IRS and the 2012 attack in Benghazi as examples. He's also ramping up his fundraising stops. After this week he'll have attended a dozen campaign cash events this month alone. Wednesday's, held in the leafy and exclusive Hancock Park neighborhood of Los Angeles, started at $1,000 a ticket. A Democratic official said 450 people were expected to attend. R&B star Janelle Monae performed. Part of Obama's message is encouraging Democrats to show up on Election Day, a task historically difficult in midterm years. "People don't even know there's an election," he said Wednesday. Democrats, he said, we surprised in 2010 when their party lost control of the House of Representatives. "What happened to Nancy Pelosi?" he said people asked him. "What happened is y'all didn't vote. And that's when all kinds of - stuff - happened. That's what it was. Stuff." DC needs less Obama, he is a self serving narcissist with no backbone. If Obama wants less scandal in Washington, he could resign and do his part to clean up that festering swamp. Members of Congress love scandals. They allow the members to focus on these scandals – real or perceived because they can avoid legislation.. They were elected to serve and to make sure that their constituents needs are met. Many of them would prefer to stay with their own agendas and are not willing to work with members who do not agree with them. The approval rating in very low yet we keep electing these members to serve again and again. The only PHONY thing in DC is Obammys leadership abilities. Barry needs to look at the mirror, tell the image in front of him "look here, no more scandals OK? Make sure all participants disappear." He obviously must go if he wants less scandal. And tell him to take Hillary with him. Yes. Scandals is a good description of how our government is working. And it will continue that way untill both sides ever start actualy doing what they swore to do when they were elected. Phony Scandals? You really don't have a clue, do you? Obama: Washington could do with less 'Scandal'. That is the funniest line I have heard this year! Obama is the scandal. So admit it Mr. President. and I use that term loosely. Ob*ma's Presidency is one scandal, after another. The most Scandalous thing, is how this INCOMPETENT COMMUNITY ORGANIZER was elected TWICE!!! Thats like Henry Ford saying America could use less cars. The world is burning down around him and he goes on a fundraising tour to whine about being called out? Honestly, I would respect him more if he just stood up and said that he directed all of the "scandals" to happen. Then at least we could infer that he is in charge of his administration. Right now, it just kind of does it's own thing and gets into trouble. I guess that's what happens when people elect a non-leader. To the haters . . . . if you have never watched Scandal or heard any of Kerry's interviews . . . . . .they have had politician staff come up to them and ask them "how do you know that" . . . . "where did you hear that happens", etc., etc. The only thing that is phony is Obama. The "Scandal" here is Obama as president of the United States. Obama is a gifted orator but that’s where it ends. Agreed Mr. President! 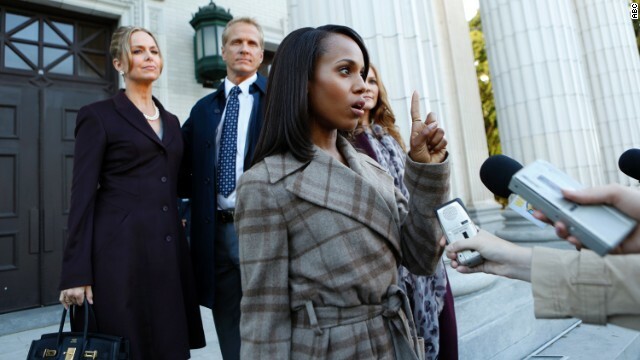 I love the tv show Scandal but I definitely wouldn't want to see any of that play out in real life. The Clinton/Lewinsky stuff was enough. But boy wouldn't that make the GOP giddy?? Let's help stem the tide of corruption, all you have to do is vote!! Its well worth the time, and I think more people are waking to the gop governoring style in their states. It's just so amazing that they stay in power, really is. Less scandals. Well Barack perhaps you can come clean and tell the American people about how you lied to the American people and encouraged your fellow Democrats to go out and lie to sell the Democrats ACA. Perhaps you can tell the truth about why a border agent had to die with weapons that were provided by Eric Holder and then you gave him Executive Privileges. Or could you tell the truth about why four Americans were left to die in Benghazi while you were in Vegas. Or why the IRS is being told to stall. Barack all those scandals start one place and that person, you, are not being honest with the American tax payers, perhaps those opposed to the word scandal should look at the real problem, YOU Barack are the problem.